TIP – Nunua Na Credo: How to purchase Windows Phone apps using your Safaricom Airtime (Carrier Billing). The majority of their customers haven’t made the switch to mobile technology for news consumption. They can analyse the effects of the digital news transition in other countries before implementing their local strategies. News Websites rendered on Windows Phone. The Daily Nation (Nation Media Group), Standard Digital (The Standard Media Group) and The Star have full featured websites. However, only the Daily Nation’s website is a mobile responsive designed site. Mobile responsive design means that the website renders automatically to mobile devices to ensure a consistent and pleasurable user experience. Though the Standard Media website attempts to render itself to the mobile screen, the end result leaves much to be desired. The Star website does not even attempt to render itself to mobile screen and only displays the desktop website. This means the user has to constantly zoom in and pan to read articles. The downside of websites is that they don’t push news to the user. You have to go and open the website, and read. Meaning you can miss breaking news. TIP: Windows Phone allows you to “pin” a website to your start screen for easy access. Open the website on your phone, expand the browser menu, and select “Pin To Start”. You get a tile showing the website on your start screen. In some websites, you may even get a “Live Tile” that automatically updates with new content from the site. Our Techweez site has this feature. Try it for yourself and see, while you wait for the official TechWeez Windows Phone app (coming soon). The power of Apps is that they can utilize the “Always Connected” status of mobile devices together with the sensors available in today’s mobile devices (GPS, gyroscope, accelerometer, etc.) to provide an integrated user experience that offers more value than just static content. Users can now have content delivered dynamically to them, with a UI that matches the operating system of the user’s device. Kenya’s News Industry have started on this journey with the development of such applications. Admittedly, this development is further along on the Android platform (with both the Daily Nation Media Group and Standard Media group both offer their own native apps.) 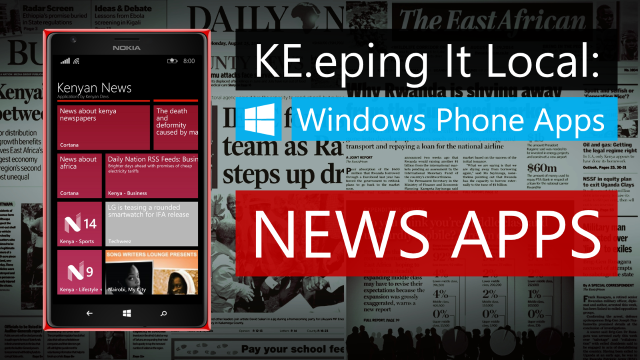 Listed below are best Native Windows Phone Apps for News in Kenya. Released just a few weeks ago, the Safaricom Daily Nation Reader app provides Safaricom subscribers access to the Daily Nation PDF version on their phones. The app will download the PDF EPaper to your phone. Safaricom and Nation Media Group are pleased to bring you the Daily Nation Epaper Reader. Read your favorite newspaper in digital format for free on your Mobiles and Tablet. Get FREE 3 month’s subscription to the Daily Nation epaper. Data charges apply. Developed by Microsoft, the Bing News app offers great content from all over the world. You can select a region for more focused news (e.g. UK, SA, US etc.). Even though it does not offer a dedicated Kenya region, you can still add topics like “Kenya News”, Kenya Newspapers etc.”. Bing News App is also a universal app, meaning that your chosen content syncs seamless between the Windows Phone and Windows 8 apps. News Republic is a popular cross platform News aggregator app that enables its users to select their news content by topic. Recommended. Both the official Standard Media Group and Daily Nation Windows Phone apps are nearing completion. The Standard Media app and should be in the App Store by the end of this month / early September, with the Daily Nation following some time after that. RSS Feeds remain the best way for a Windows Phone user in Kenya to get their fix of local news. RSS (Real Simple Syndication) is a web standard that allows website to automatically distribute content across the web. The process to subscribing and consuming a RSS Feed is simple. All you need is the link to the RSS Feed address and a News Reader app. Services like Feedly, provide an easy way to manage RSS Feed collections, integrate them into News Reader apps and also allow you to export your feed list. The advantage of using RSS Feeds over dedicated apps is that you can mix and match your news sources to your liking. For example, you may prefer to have National news from all the five different sources in one feed collection, and only choose to have two sources in your sports feed collection. However, apps can offer more functionality over their content if designed right. To make your life easier when looking for RSS Feeds for Kenyan news, I’ve complied several Feedly lists that you can easily download (click on link to download the OPML file) and import to you news reader, or add to your Feedly account. To see the full list of feeds within each list, click here. Listed below are some of the top rated news reader in Windows Phone Store. NextGen reader is a personal favourite. Though it is a paid app, it has a full featured trial. You can easily import your RSS feeds as well discover new feeds within the app. A fast, clean and beautiful RSS reader for Windows and Windows Phone. Login once and run on multiple devices. Clean, modern design, inspired from Windows Phone. Offline support, image caching and a lot more. Read full articles (powered by Readability). Discover popular feeds or browse through categories. Share articles on your social networks. Save to OneNote, Pocket, Readability and others. One of the more stunning News Reader apps, Magnify offers a beautiful experience. I implore all of you to give feedback to the app developers and content owners on how their app helped you, or what areas they need to work on. If you can’t contact the developer, be sure to reach out to myself @NairobiWP, @TechWeez, @NokiaEastAfrica or @MicrosoftEA.